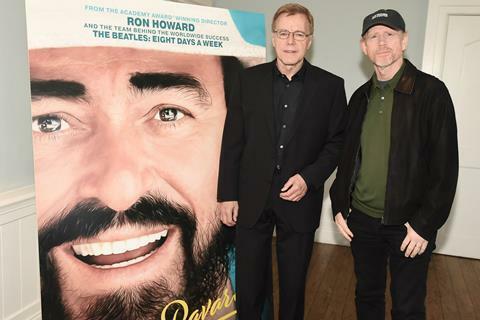 HanWay Films is understood to have closed two major deals on its Luciano Pavarotti documentary, which Ron Howard trumpeted to AFM buyers at a sizzle reel presentation at Shutters on the Beach on Saturday . “I had no idea how charismatic he was,” Howard said of the late Italian tenor, whom he had admired from afar despite not being an opera aficionado prior to embarking on his third documentary. However for Howard, the story of the world-renowned Pavarotti was very different to that of The Fab Four, whom he profiled in The Beatles: Eight Days A Week – The Touring Years. “There’s so much footage and he is so funny and wise and revealing in his interviews so I thought, ‘Let’s let him tell this story.’ It’s really a character study,” said Howard. The sizzle showed Pavarotti at his first rehearsal with Placido Domingo and José Carreras in their incarnation as The Three Tenors, and previously unseen footage of Pavarotti singing in the Amazon rainforest, where he performed in the 1990s to a deserted Amazon Theatre that featured in the film Fizzcarraldo. Pavarotti touches on the great tenor’s activism in later life and features on-camera contributions from Bono, and his widow Nicoletta Mantovani. Producer Jeanne Elfant Festa of White Horse Pictures was instrumental in getting the cooperation of Pavarotti’s first wife Adua Veroni, and Mantovani. “It’s very clear from the film he is a world citizen,” said producer Nigel Sinclair of White Horse Pictures, who collaborated with Howard on The Beatles documentary. Sinclair told Screendaily the music will be mixed in Dolby Atmos. “Pavarotti’s voice has so much texture and listening to it, you can almost feel you can touch it.” Sinclair added that the plan is to play three arias sung by Pavarotti after theatrical presentations as a bonus for cinema-goers. Pavarotti is being produced by Polygram Entertainment, Decca Records, Imagine Entertainment, and White Horse Pictures.